Università station of Line 1 of the Naples Metro is in the city centre. It is in a spot from where you can reach the main streets of the historic centre and several monuments. Like many of the art stations, even the Università one is an architectural work worth of attention itself. 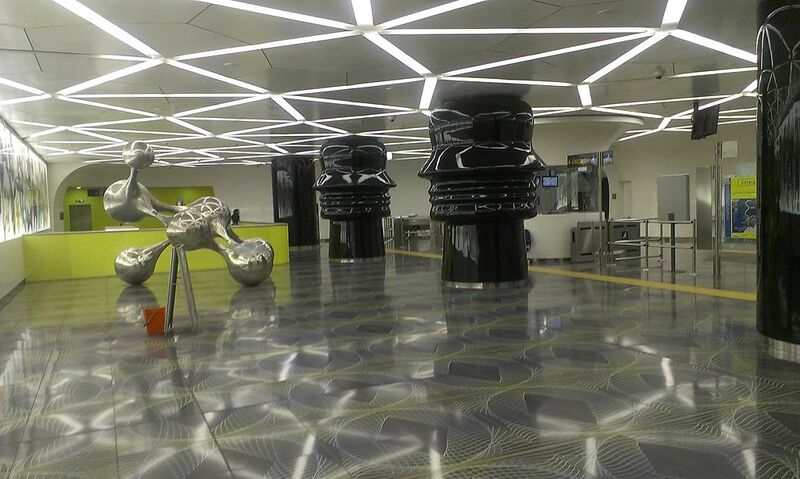 The station was designed in collaboration by two architects: the Italian Alessandro Mendini and the Egyptian designer Karim Rashid. Their project also won a prize in 2011: Emirates Leaf International Awardin London. The name of the station is due to its proximity to the historical universities of the city (Federico II and the Orientale) – Università means University. Another feature are the light effects given by the three-dimensional panels that offer optical games. The only reference to the the past included in the project of Università station by the designer Rashid are the representations of Dante and Beatrice (a reference to the Divine Comedy). From Università station you can easily reach the tourist ports of the city that are in Calata di Massa and at Immacolatella. You can go there through Nuova Marina street. Another great street and landmark of the city is Corso Umberto. The Universitàstation is in Piazza Bovio, a square directly connected to Corso Umberto. From there it is possible to visit the historical venues of the University of the city Federico II and the Orientale University. The headquarters of Federico II also have cloisters with gardens. From Corso Umberto you can also visit other historic streets of Naples, such as the Borgo Orefici (i.e. Goldsmith alley), so called for the many goldsmith shops in that area, and Piazza Nicola Amore from which it is possible to go to via Duomo that leads to the main cathedral of Naples. Another district that can be reached from Corso Umberto is Mercato, where you can visit many historic churches and join marketsthat take place in the morning, although you really need to pay attention to pickpockets. If you want to know more about Naples Metro, don’t forget to take a look to theBookingNaplesFree Guide aboutNaples Metro!